The Devils Standtable Area is the main bouldering area in the park. Many boulder problems have been put up and this page will continually be updated with more and more information. To help make this area easier to navigate via mountain project, the specific spots will be alphabetically grouped in the order you would walk to by coming up the main trail. The main trail from the parking lot leads to the Gill Roof first, and from there every other area continues on to the right. Great sandstone bouldering as well as some traditional lead climbing opportunities are available. Perfect place for a day trip since it is so close to Carbondale. 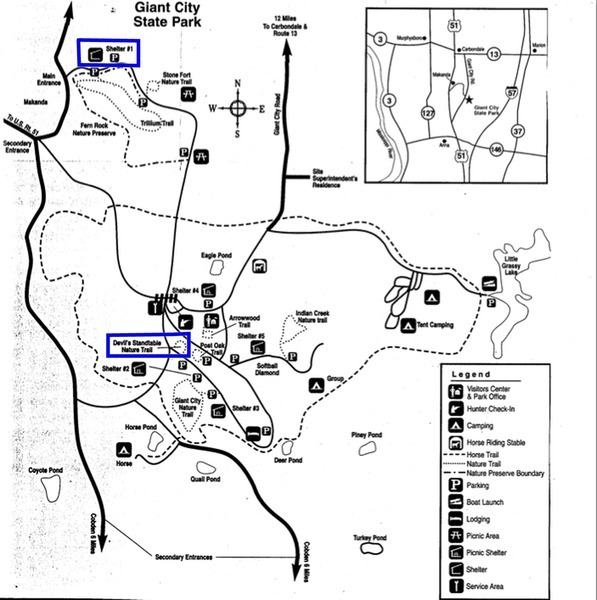 Camping is available at the Giant City Park Campgrounds. HELP THE ICA RETRO-BOLT GIANT CITY! Click HERE to donate towards the Illinois Climber Association's retro-bolting cause. The ICA has been instrumental in conserving access to the climbing at GIANT CITY. If you have any questions, comments or concerns feel free to contact them.